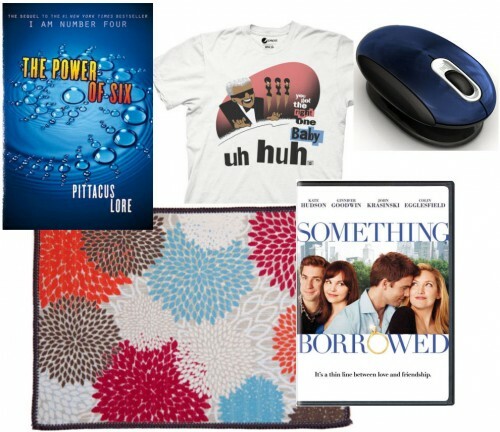 Be up-to-date with the latest entertainment, gadget, and fashion trends by winning this prize pack worth over $100. ***If you are a Facebook fan, you must Like this post ON Facebook AND the original interview, which is HERE. Please note that leaving a comment on Facebook does not replace ‘Liking’ the story. If you wish to leave a comment as well, please leave it under the story post and not as a separate post. (8) Contest ends Tuesday, August 16, 2011 at 8pm EST / 5pm PST. Winner will be notified either by email, Twitter or Facebook. If contest winner does not provide a valid mailing address by the specified time, another winner will be chosen. What two artists are on the soundtrack for this film? Take the relationship test for Something Borrowed HERE! Learn more about The Power of Six HERE! Learn more about the Smartfish: Whirl Mini Notebook Mouse HERE! Learn more about the Toddy Gear: Toddy Smart Cloth HERE! WOW! This is an INCREDIBLE contest! Check it out!